Damages caused by foreign objects entering the turbocharger on the suction or the exhaust side are clearly visible on the wheels of the turbine and compressor. 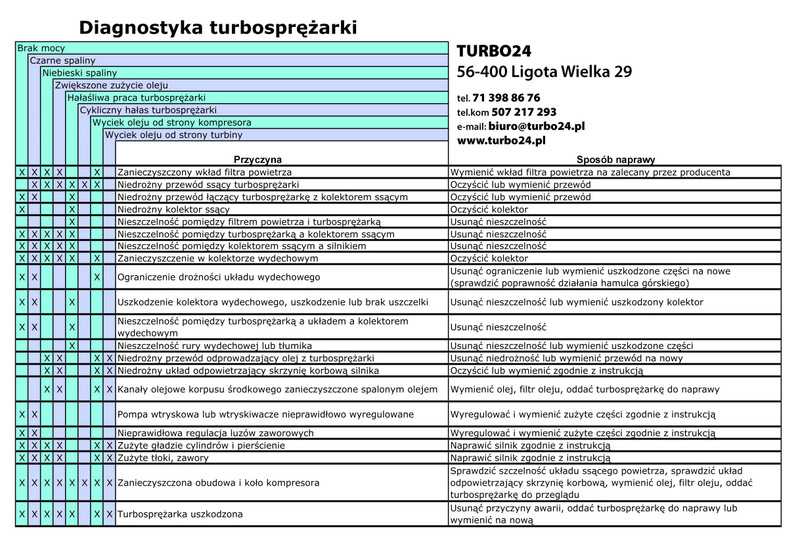 Before replacing a turbocharger, check the purity of the intake and exhaust systems. Interruptions in the supply of oil in repeated short periods of time causes polishing and firing the bearing surfaces. The accumulation of spent oil is caused by excessive temperature exhaust or engine shut-off too quickly after work. It is recommended that you leave the engine after working for 2, 3 minutes at idling speed (time required to cool the turbocharger). The transition high temperature from exhaust side of turbocharger to central corps causes burning of oil and corrosion of the bearings of a turbocharger. Major damages occur in the ring, the grooves of turbine shaft and the bearing of the turbine. The principle of turbocharger is simple. It consists of two rotors placed on a common shaft. One of them is located in the exhaust system and is driven by exhaust gas extracting energy from the engine. The second rotor is located in the inlet manifold. Thanks to a specially contoured shoulders, and under the influence of rotation of the shaft he pumped air into the engine at a pressure higher than atmospheric pressure. Then the engine is running efficiently. It’s because of the produced power which depends on the dose of fuel that was burned at a given time. You must provide enough oxygen to burning to be effective. 14 kg of air is required to burn 1 kg of fuel. More pumped air can burn more fuel respectively with the same speed and the same engine. The mixture burns more, so fumes are less toxic. Ta strona wykorzystuje pliki cookie, aby zapewnić użytkownikom większą wygodę korzystania z serwisu.